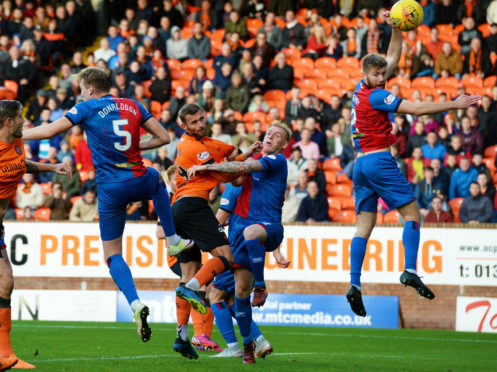 20/10/18 LADBROKES PREMIERSHIP DUNDEE UNITED V INVERNESS CT TANNADICE - DUNDEE Dundee United's Pavol Safranko (C) rises highest to head the hosts in front. Caley Thistle came from behind to secure a 1-1 draw against Dundee United at Tannadice with 10 men. United had taken a deserved lead early in the second half through Pavol Safranko’s header, however Inverness responded well and restored parity on 73 minutes through Jordan White’s header. Former United defender Donaldson was later dismissed for a second booking but Caley Jags held on, extending their unbeaten league run to 20 matches and keeping them within five points of the Championship summit. Caley Jags boss John Robertson made one change from the team which drew 1-1 at home to Morton a fortnight previously, with Riccardo Calder drafted in to replace Aaron Doran. Although United were backed by a strong support turning out for Robbie Neilson’s first home game in charge, Inverness began brightly, with a drilled low delivery by Carl Tremarco cut out by defender Frederic Frans. United began to show some encouraging signs however, with former Caley Jags winger Billy King seeing a dangerous cross cut out by Coll Donaldson, while Paul McMullan’s low shot was comfortably gathered by Mark Ridgers. The home side tested Ridgers again through efforts from McMullan and King, however the best chance of the first half arrived for the hosts on 36 minutes when attacker Pavol Safranko shaped a low shot, which forced a saving block from Caley Jags defender Brad Mckay. The hosts produced another flurry just before the interval, with Mckay seeing his clearance from McMullan’s cross drift inches past Ridgers’ left-hand post, before defender Rachid Bouhenna saw an effort cleared off the line by Sean Welsh. Caley Thistle had a decent chance to break the deadlock early in the second half when Tremarco’s cross picked out White who headed over. United were inches from going ahead on 53 minutes when Safranko was picked out by a pinpoint delivery from Fraser Aird, but guided his header just past the post. United’s opener did arrive just two minutes later with the same two players combining once again, with Aird’s corner flashed into the net by the head of the unmarked Safranko. Caley Jags looked for a response, with a neat move seeing Welsh release Shaun Rooney, whose drilled delivery picked out substitute Doran at the far post, only for the ball to somehow be smothered by goalkeeper Benjamin Siergrist. Inverness’ equaliser did arrive on 73 minutes however, with White rising above a packed penalty area to nod Polworth’s free kick into Siegrist’s far corner. Donaldson’s joy turned to despair just 10 minutes later when he was shown a second yellow card by referee Euan Anderson for persistent fouling, however United were unable to take advantage.